Graduates of the Goffs UK Aintree Sale have been setting the track alight with some superb performances at the highest level and tonight they starred in the sale ring with Aintree’s iconic winners enclosure seeing a new record top price of £440,000. Colin Bowe’s Milestone Stables produced Samcro to top the inaugural sale in 2016 for £335,000 and that record was comprehensively beaten tonight with his new star, the debut winning Pointer Papa Tango Charly (Lot 12), who sold to Aidan Kennedy for £440,000. The 4YO was one of 13 six-figure horses sold and one of four to make £200,000 or more - driving the average to a record £127,920. Josh Ryan’s debut winning Pointer Adrimel (Lot 9) was another to command plenty of attention in the ring and was eventually knocked down to Ed Bailey Bloodstock for £280,000. Other lots to feature included Camas Park Stud’s Bumper winner Fiddlerontheroof (Lot 10), who sold to Ross Doyle and Colin Tizzard for £200,000 and Donnchadh Doyle’s Grandads Cottage (Lot 15), who was purchased by Aiden and Olly Murphy for £200,000. Gigginstown House Stud’s two Randox Health Grand National runners Don Poli (Lot 1) and Outlander (Lot 2) also proved very popular, selling to Philip Kirby and JD Moore for £170,000 and £165,000 respectively. 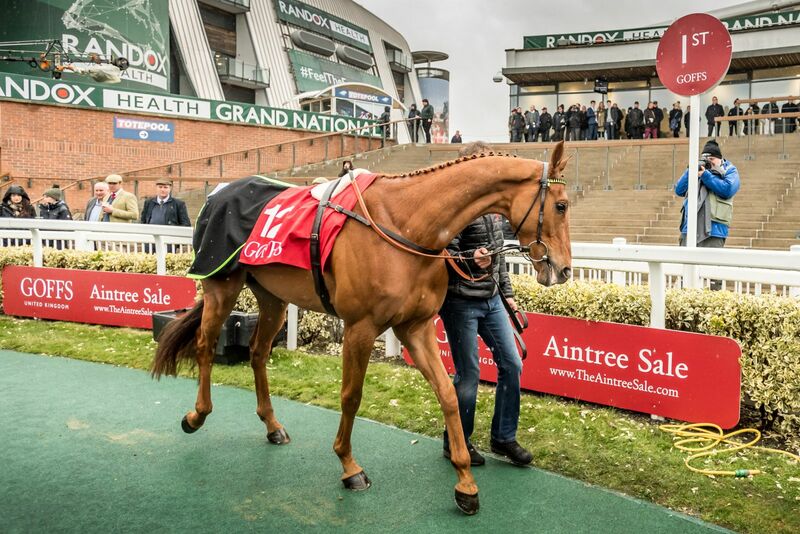 “The Aintree Sale has firmly established itself as an elite boutique outlet for high-class Pointers and Form Horses. The results this sale has been achieving on the track, headlined most recently by Topofthegame, and a vintage 2019 catalogue allowed us to attract the who’s who of the National Hunt world and tonight’s results reflect its ever-growing status.